Easter: the bank holiday consisting of four days off work where it’s okay to just sit, eat chocolate and you don’t have to buy anyone presents. What’s not to like? With next-to-no plans on this rainy long weekend and plenty of time on my hands, I wanted to get back in the kitchen experimenting. One of my favourite Easter treats are mini eggs – what do they put in them to make them so addictive?! – so I wanted to incorporate them into my baking. These are delicious, really easy and just need to be popped in the fridge! Put the digestives in a bowl and smash them into small pieces using a rolling pin. Cut up the mini eggs into halves and smaller pieces and add three-quarters of the eggs to the digestives. Break up all of the chocolate and place it in a saucepan with the golden syrup and butter. Melt the mixture on a low heat, stirring consistently so it doesn’t burn. 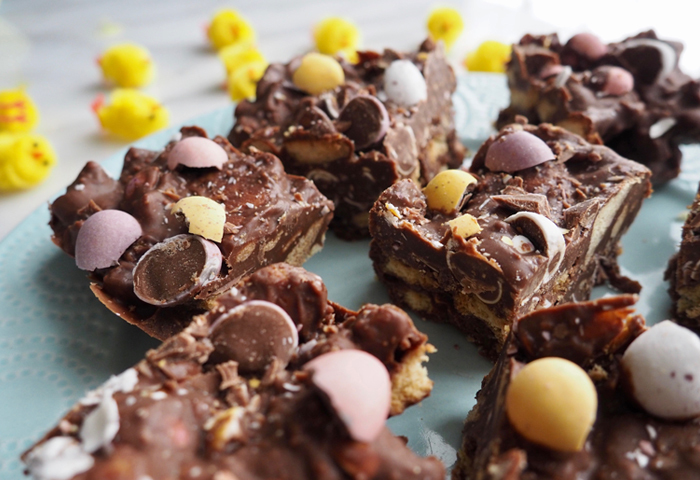 When it’s all melted into a smooth chocolate sauce, pour it over the mini eggs and biscuit mixture and stir so everything is covered in chocolate. Line a deep tray with clingfilm, and pour in the mixture. You want to push the mixture together rather that spreading it across the whole tray, so you get deeper cakes! 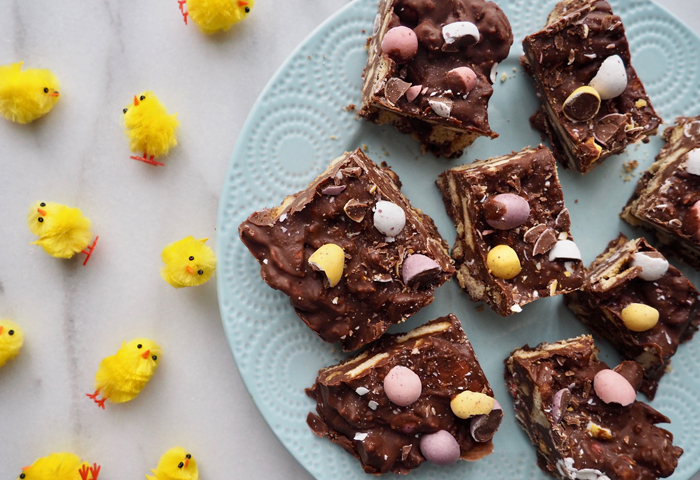 Sprinkle the remaining chopped mini eggs over the top and pop in the fridge for at least three hours. Cut as desired! Be sure to tag me on Instagram @kirstiepickering if you give these a go!